It’s not often I get to go see a movie on opening weekend, but when I do, it needs to be a treat. This particular movie did not let me down. This last weekend, we were able to make it out. And what did we go see? Us. No, not ourselves. We didn’t go look at ourselves in the mirror, that would be incredibly narcissistic. And probably a little boring. No, we went to go see Jordan Peele’s latest horror thriller, Us. Us is an interesting mind-bender of a film. I saw someone comment that it starts as a basic home-invasion kind of story and gets crazy from there. But I don’t know if that’s true. I mean, the movie is pretty crazy from the get-go. Sure it gets crazier, but it’s really not mundane at any point. The film opens in 1986 with a promo for Hands Across America. The first scene shows us a young Adelaide Wilson (played at this point by Madison Curry). Adelaide wanders off from her family while visiting Santa Cruz Boardwalk for her birthday. As an audience, we’re already primed for something to happen, so every little corner she turns just plucks that little tension cord. She ends up down on the beach and finds a hall of mirrors-like attraction. Being a kid, she naturally wanders into the dark and creepy building. What happens inside sets the stage for the whole movie and gives us our first real piece of the level of creep this movie is heading for. The film really gets started when we jump to Adelaide and her present-day family on a Summer vacation to Santa Cruz. However, at the mere mention of the Boardwalk, she is visibly shaken and wants to stay away. This is clearly something she’s never discussed with him, so without context, her husband pushes and they go. Of course, by the time they get to the beach, we’re already seeing a pattern of strange events, and so is she. Later that night, back at home, we get the trigger event that is shown in the trailer: the family standing outside. From here we get the home invasion aspect that I already mentioned, but to me it’s anything but typical. We’re already seeing that these invaders are pretty nuts and the movie is quick to show us that they’re the family’s dopplegangers. The big-burly father gets taken out of the fight (though certainly not killed) pretty quickly, so the rest of the family falls a submissive survival state. In fact, this is one of the few things that did bother me. The father spends an inordinate amount of time crawling on the floor whimpering, moaning and grunting. I would have thought he’d fight back a little more, but maybe he’s just a gentle-giant-kind of guy. There’s some good fighting and chasing, still keeping with a somewhat traditional suspense/horror themes. I don’t think it’s too spoilery to say that at about half-way through the film the family gets away. Obviously, there’s more to come. One of the trailers I saw showed Elizabeth Moss’ character, Kitty, hurt and bloody. It’s this scene with Kitty’s family that really starts our descent into WTF territory. And that descent is like an inverted standard deviation curve. The further along we get, the sharper that fall off becomes. I gotta be honest, I wasn’t all that bothered when Kitty’s husband gets it. I mean the guy was kind of a douche. Same thing with their twins. Actually, I wasn’t too broken up about Kitty either. Her character wasn’t terribly likable to me. In fact, that whole family felt a little disposable.The Wilson family’s revenge on Kitty’s group of dopplegangers, on the other hand, was completely righteous and amazing. I really liked it when Zora killed the twins’ dopplegangers and when Jason killed Kitty’s. Probably one of the funniest moments though, was the brief argument in the car over who has the most kills. This comes out of left field and yet it’s still entirely appropriate. It’s a tiny bit of levity in a very tense situation that is almost a nod to zombie movie fans. There’s honestly very little I have to say that is critical about this flick. Probably my biggest complaint is at the very beginning. There wasn’t really anything in the promos (that I remember) about the set-up in 1986. Also, the intro/narration text at the beginning completely confused me. Now I get it (by the end of the film I wasn’t even thinking about it), but that little piece of foreshadowing was really disconnected from the rest of the movie, in my opinion. There’s also a scene, when Nyong’o’s character is discussing going back to Santa Cruz Boardwalk with her husband that kind of bothered me a little. 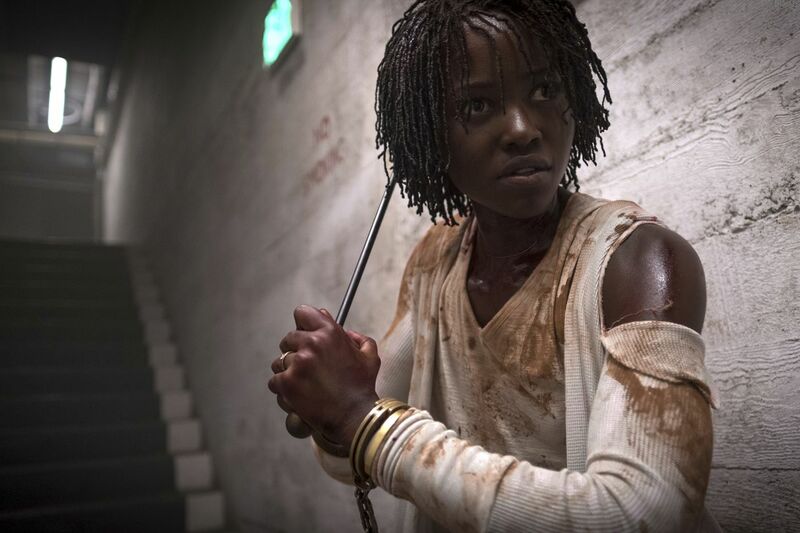 Given the nature of Nyong’o’s character, her shift from being distractedly worried to a quivering voice and near-mental breakdown was a little abrupt for me. She confesses to him a bit of her past, all the while her voice is shaking and she sounds more like a terrified child. That’s not to say that fear isn’t justified, but it was like flipping a switch and just felt a little too abrupt for me. It could be that this was intentional, and another foreshadowing tool, but it did not come across that way. There is one thing I found interesting that bothered me at first but the more I thought about it the more I thought it might be intentional. 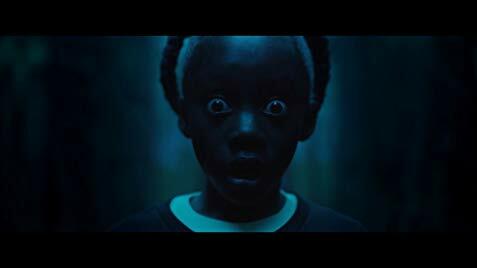 Throughout the whole movie, Lupita Nyong’o kind of creeped me out. Something about her expressions, I think it was her eyes. She has a stare in this movie that just kind of reaches into you. I never got that vibe from her in Black Panther, even though she was a rather intense warrior. As I said, the more I think about it, the more I think it was intentional, another piece of foreshadowing. Other than those two little things I’ve already mentioned, I really have nothing else negative or critical to say about this movie. I thought the action was good, and fairly realistic. When the father’s knee gets whacked, it stays damaged. He’s not running around ten minutes later. Also, the tension is very consistent, and maintains a solid ramp up all the way to the end. The moments where Peele lets up are very brief, and act more like a chance for the audience, like the characters, to just catch a breath and get ready for the next wave of chaos. Overall, this was a great movie. It’s creepy and disturbing through out, and by the end it’s very weird. And to me, that’s part of what makes it work so well. Peel could have taken an easy way out with the end, gone with a more formulaic ending, but he didn’t. He had this crazy-as-balls idea and followed it through to its twisted end. And to his credit, he doesn’t answer all the questions. In fact, he probably leaves us with far more questions than answers. I’m okay with that. In truth, Peele has created this new, insane world that has tons of space for story telling, but in a way I hope he doesn’t do more. Us leaves us with a savory and unsettling taste in our mouths that doesn’t need a follow-up. Instead, it needs to stand on its own and linger in the backs of our minds, making us wonder what the Hell The Tethered really are and what really is going on down in all those tunnels.